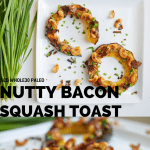 First, it was avocado toast, then it was the sweet potato toast… which not to brag, but I had a few of mine featured on Buzzfeed & Huffington Post. Okay. That was bragging. Well, forget about those because we have a new toast in town. Many of you know, I try to keep things relatively low carb around here, it keeps my gut happy. 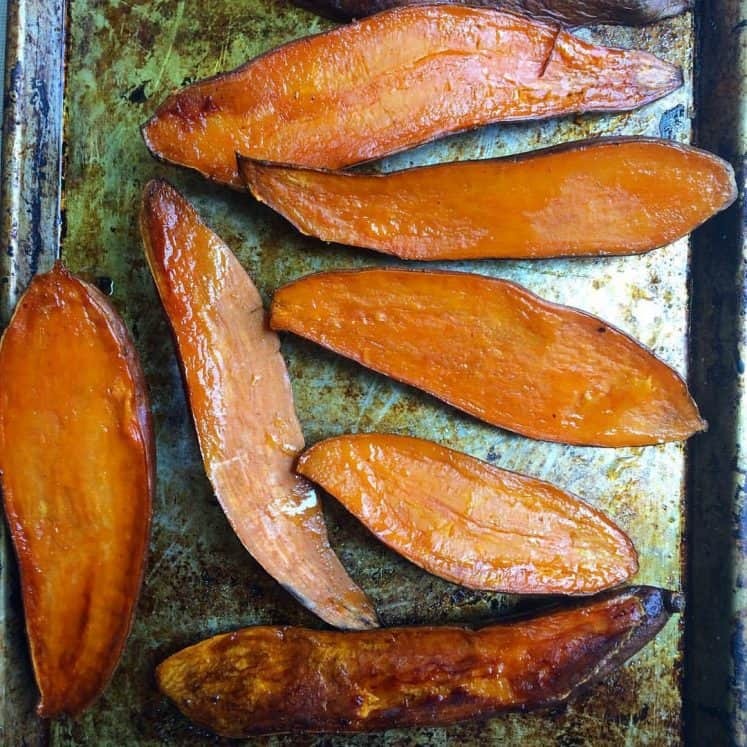 Although I do allow myself sweet potatoes and other starchy produce every few days. A few weeks ago I saw a post on an autoimmune paleo support group on Facebook, about someone creating a recipe that was AIP and SCD. SCD is the specific carbohydrate diet. Which pretty much eliminates any complex carbs which don’t easily absorb during the digestive process and can be left behind to feed the bacteria in your gut. Now PRE-biotics, like most tubers have their benefits. We usually WANT to feed the healthy bacteria in our gut. Unless we have bad bacteria. If our guts got some nasties in it, these complex carbs are going to feed them to and we don’t want that. 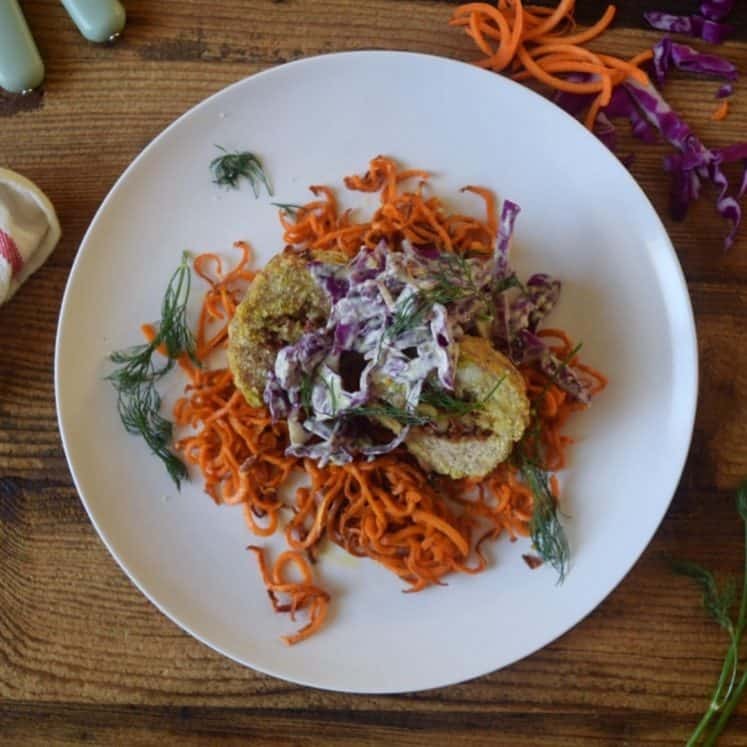 I had SIBO, small intestine bacterial overgrowth, and had to adhere to a low carb/ low starch (SCD) version of AIP/ Paleo to get my healing on track. I find this to be a pretty common scenario. A lot of folks, a few weeks or months into their AIP (autoimmune protocol), frustrated because they are still flaring, learn that they have SIBO and then begin to omit compliant starchy foods from their diet. To include most sweeteners and fruit. Its tough, to be on such a restricted and have to remove even more things from your diet. AS WE LEARN MORE ABOUT OUR BODIES NEED AND PREFERENCES, WE COPE, THEN WE ACCLIMATE AND EVENTUALLY WE THRIVE WITHIN THESE RESTRICTIONS. I have been fortunate to successfully reintroduce eggs, nuts, and most seed-based spices back into my diet. Nightshades are a hard no. Dairy is ok, as long as it’s low in lactose. Carbohydrates are fine in moderation. But if I eat a bowl of white rice I’ll be hurting later. It’s ok though. Anywho… I’ve kind of went off on a rant here. The point of this whole thing is that the post I saw on Facebook reminded me of when I created SCD specific recipes and how I want to get back to it, although many of them are already by default. So here’s a toast for all you SDC folks out there. Because no one likes to be left out of the fun. Especially when it looks this good! 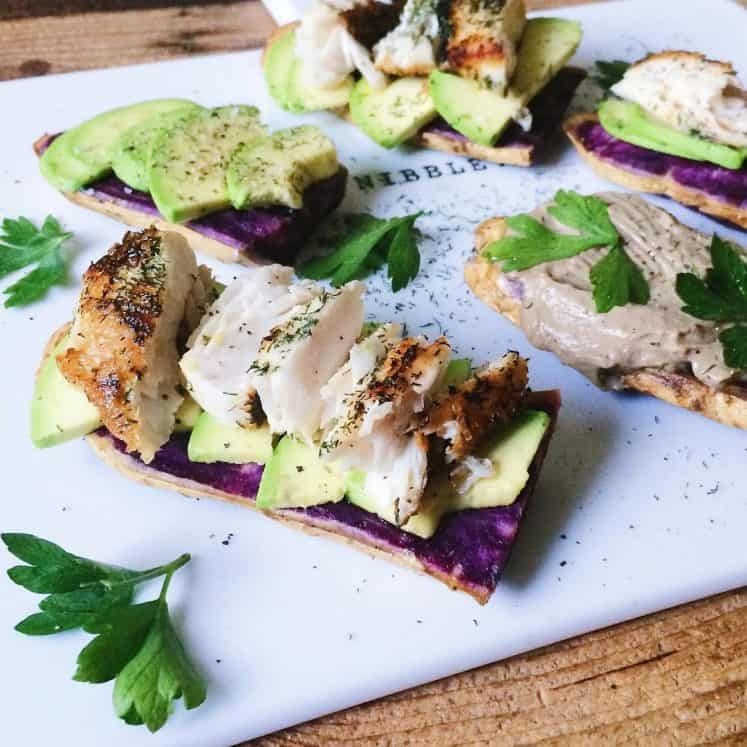 This low Fodmap Toast is a great way to have your paleo toast that is still low starch! 1/2 tsp cinnamon or pumpkin spice would be great too! Slice acorn squash vertically into 1/2 inch thick rounds. Rub with olive oil. Roast for 20 minutes. In the meantime, heat a dry skillet on medium-high heat. Add in the raw cashews and toss with seasoning while you toast them. Once they begin to brown remove from the heat. Clean out the skillet, put back on the burner. Chop up bacon and add to the hot skillet. Cook until crispy, stir often. Remove from skillet and place on paper towel to drain fat. 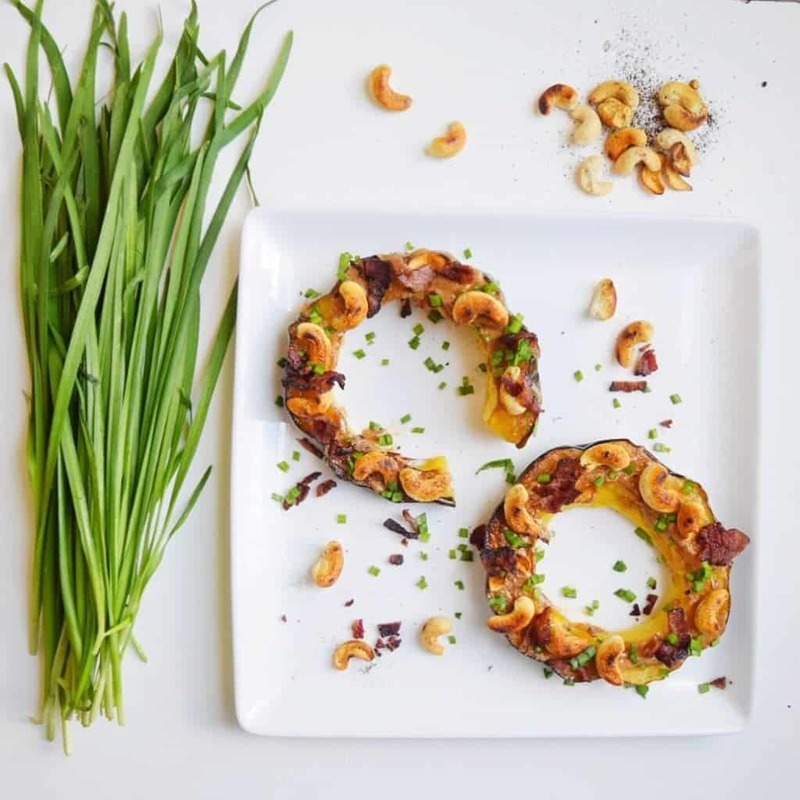 Spread a thin layer of almond butter on your squash rounds. Place cashews on them evenly. Sprinkle salt over all of them. Add the crispy bacon to the rounds. Finally mince the chives and add them too. I like to cut the round into quarters and eat it with my hands, but you can also use utensils… but why? 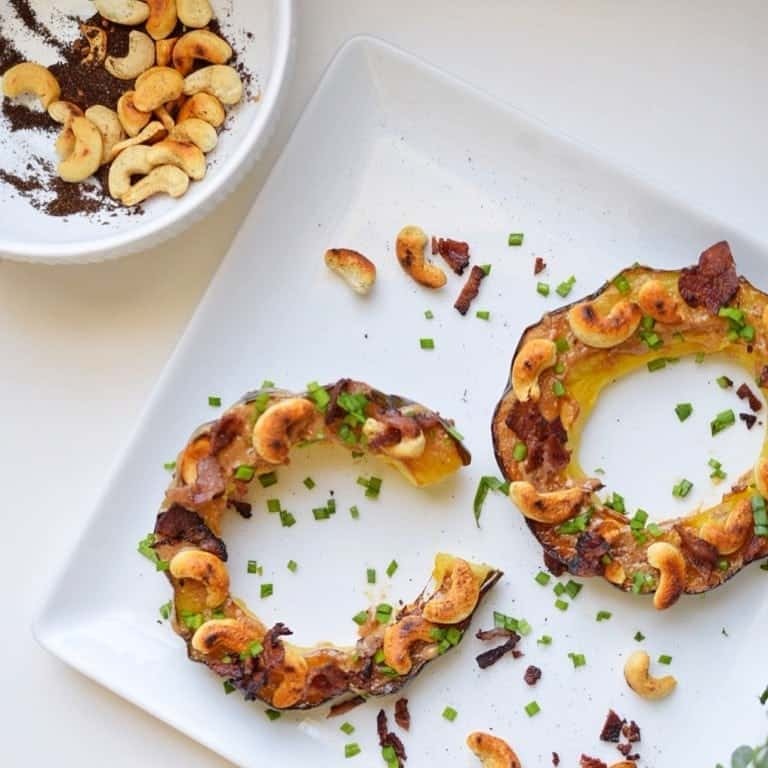 Pro Tip: Roast your acorn squash ahead of time, or the day before… makes this a 10 minute meal! 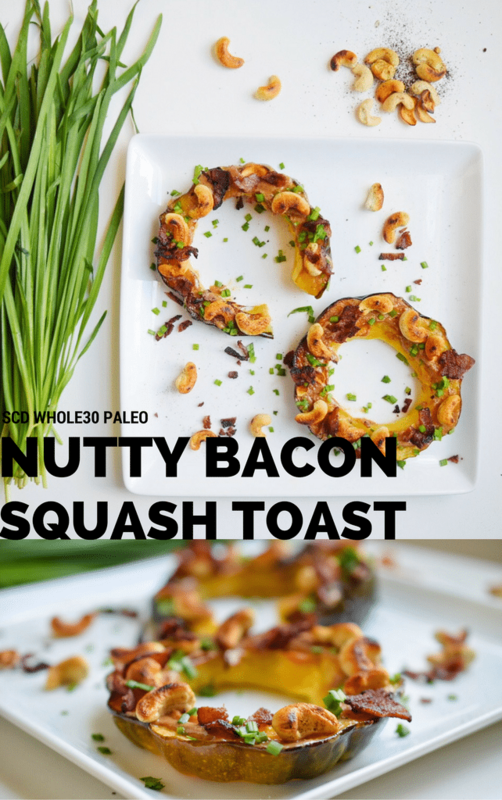 Winter Squash and bacon! Brilliant!